If you usually buy timber already cut and planed to size, then a jig saw will probably be more useful than a circular saw. 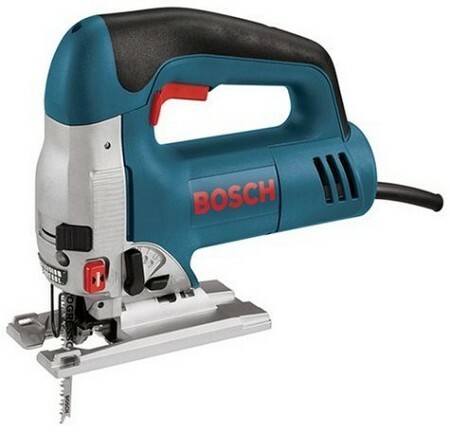 As with circular saws, most jig saws these days are integral power tools with their own motors, though you can buy a few attachments. Apart from the motor, the main part of a jig saw is the ram assembly into which the blade is fitted and held in place with a screw. The ram assembly is moved up and down by the offset pin and the bridge slider at about 3000 strokes a minute. The short blade (up to 64mm cutting length) vibrates up and down in a slot in the sole plate, which holds the material being cut. Some jig saws have a blade rol­ler guide to support the blade – this needs adjusting and lubricating. The saw blade cuts on the upstroke, so dust and the rag­ged edge appear on top of the material being cut this must be remembered when a jig saw is used on materials, like plastic laminate, which are likely to chip. Jig saws generally have their motor cool­ing fans directed to blow away dust from the line of cut. 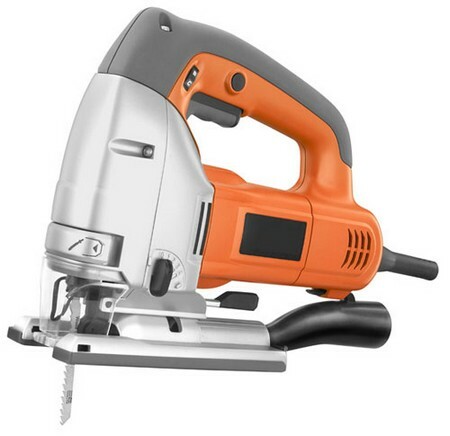 One major advantage a jig saw has over a circular saw is its safety – even if you touched the blade while it was running you would be unlikely to suffer serious injury. It is also more versatile it can be used to cut curves and enclosed cuts (a cut-out for a sink, say). But, the jig saw is much slower to use than a circular saw, especially for rip sawing, and cannot be relied upon to give such a straight cut. Various blades are available for cutting different materials (such as wood, metal, plastic, ceramic, for example) and also for different types of cutting. Knife blades are available for cutting things like cork and polystyrene. There are three features you may find on some saws. Pendulum (or orbital) action swings the blade away from the cut on the downstroke and brings it back on the upstroke. This is designed to improve cutting speed, and you can often select different degrees of pendulum action. A scroll mechanism makes it easier to cut curves or use the saw in tight corners by enabling you to turn the blade rather than the whole saw in the direction of the cut. Some saws have a circle guide (sometimes combined with a rip guide) supplied or available as an accessory. This enables the radius of a circle to be maintained. Many jig saws have variable speeds, with a speed control wheel on the body of the saw or the trigger. Lower speeds are useful for cutting materials like metal or plastics (where a fast speed might melt them); they are also useful for starting and stopping cuts and for better control when cutting curves.